I realised at the weekend that she will have forgotten about the trip almost immediately so I decided to make her a little something to open on the day, it’s so difficult to think of presents for someone in a carehome. I decided to make a little cross-stitch small which could sit in her room. Talk about last minute, I started it on Sunday afternoon! 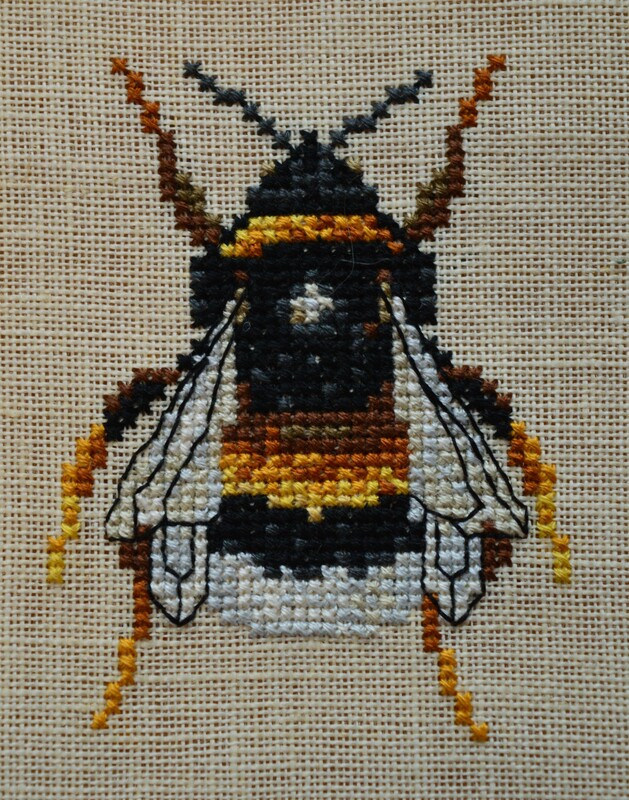 I found a gorgeous cross-stitch pattern of a bumble bee on Etsy, by Robyn’s Nest . We used to keep bees when I was a child so I hoped it might jog her memory a little. Luckily the design was quick to stitch, I finished it on Monday evening! I used a scrap of a pale gold linen which I think works perfectly. 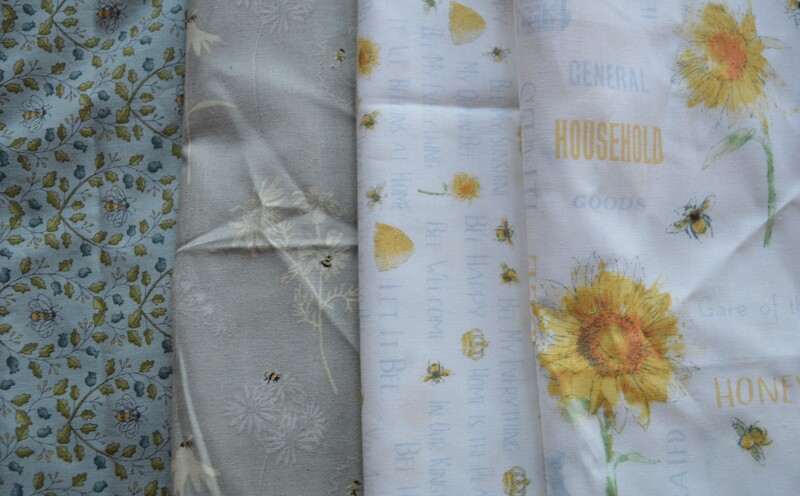 I fussy cut two bee fabrics for the front, adding a length of narrow ricrac and some bee cotton tape – it’s amazing what I find in my trimmings box , I really must have a sort out!! 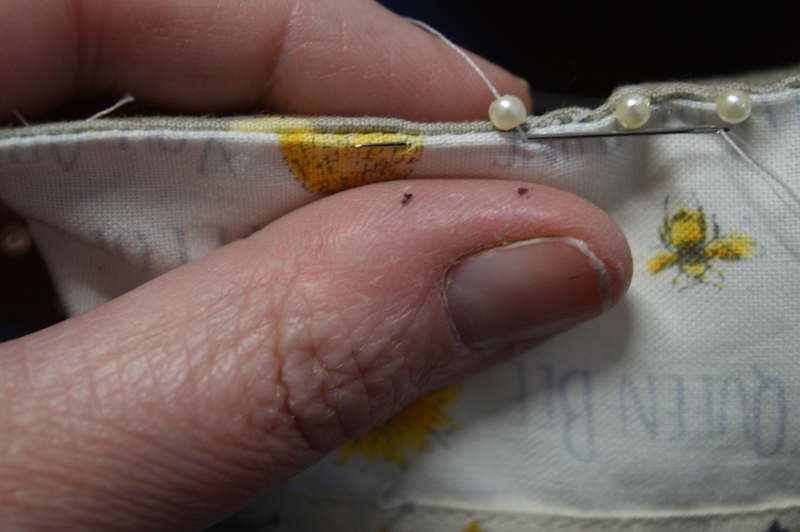 To finish the edge I found some little pearl beads which were slightly tinged with yellow. After fiddling for a while trying to stitch them on evenly I remembered a simple trick I read about years ago. I made two dots on my thumb as markers for where to stitch the beads. It worked a treat! 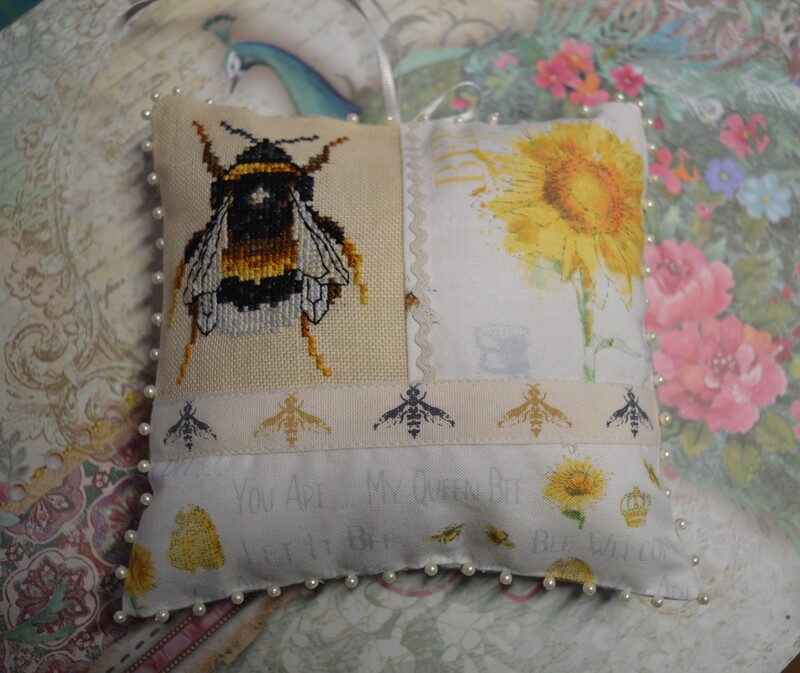 I’m pretty pleased with how it turned out, I love the bee, in fact I’m tempted to stitch one for myself! Most importantly, my mum loved it too. This entry was posted in embroidery and tagged bees, Cross-stitch smalls. Bookmark the permalink. What a delightful gift for your mum. How wonderful. So thoughtful, too. BEE-autifil! This is such a thoughtful gift❤️❤️. I have seen that tip floating around the internet. I’m glad to hear it works! What a gorgeous little gift – perfect for Mothers’ Day too, although I know you’ve already given it to her. That quilt with the golden retriever makes me awed and envious in equal measure. So creative and it looks be(e)autiful. Oh, that’s wonderful!! And so thoughtful in every detail! What a cute idea, I might need one for myself too! The dots on the thumb is brilliant!! that’s a gorgeous little cushion! 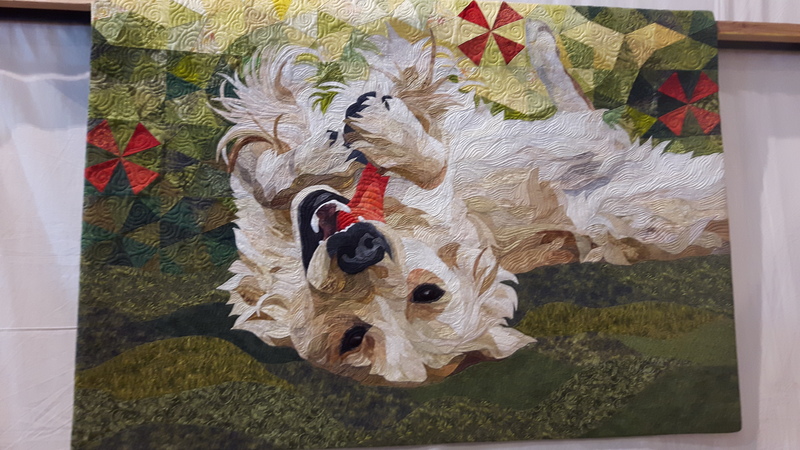 and the dog quilt is amazing . . . what a talented lady Monika Wutzl is! Really cute – and I love the little tip of using a thumb ruler. The gift looks gorgeous and hopefully put a smile on your mum’s face. Great work! Such a handy tip – the pen on thumb. What a pretty gift. I am sure that mom loved it. Beautiful, especially with the memories of bee keeping years ago. Lovely little bee piece! Your knack of combining fabric, notions and your cross stitch pieces is really so creative, inspiring! I bet your Mum loved this present. Your mum’s little bee gift is gorgeous. The cross stitch is fabulous and with the addition of those fabrics….just perfect. That’s a neat trick putting dots on your thumb to indicate where to stitch the beads. Love the quilt of that adorable dog! Oh, that is wonderful! You are thoughtful of your mother and her needs. It’s a difficult thing you are going through, but that little pincushion would lift anyone’s heart. Thanks for sharing that, and the thumb marking tip. I never heard that, and it will be helpful in CQ!